Like many of you, CH and I spent Oscar night basking in the warm glow of the TV and consuming tons of delicious food. And, since we had seen (and loved!) 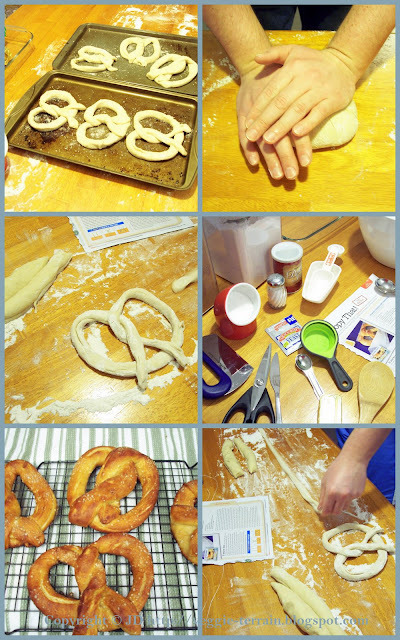 most of the nominated films, we decided to celebrate our excitement regarding the ceremony by preparing one of our favorite snacks: home-made soft pretzels. Two hours before the show started, we set all of the necessary supplies/ingredients out and got to work. 1.) Warm soymilk in saucepan until approx 110 degrees F. Pour soymilk into medium-sized bowl & add yeast, allowing to soften for about 2 mins. 2.) Stir brown sugar & 1 c. flour into soymilk with wooden spoon. Dice 2 Tbsp. butter; allow to soften & stir into mix. 4.) Shape into a ball, & place in lightly greased bowl. Cover bowl with plastic wrap, place in a warm spot, & allow dough to rise for approx. 1 hr, or until doubled in size. 5.) Pre-heat oven to 450 degrees F, & grease a large baking sheet. 6.) Punch dough to deflate, then turn out onto a lightly floured surface & divide into 6 pieces. 7.) Roll & stretch dough until approx. 30 in. long, holding ends & slapping the middle of the rope on the counter while stretching. 8.) Form each rope into a pretzel shape: make a "U" shape; hold the ends of the rope & cross them over each other once; then, press the ends into the bottom of the "U" to form the pretzel. 9.) Dissolve baking soda in 3 c. warm water, in a shallow baking dish. 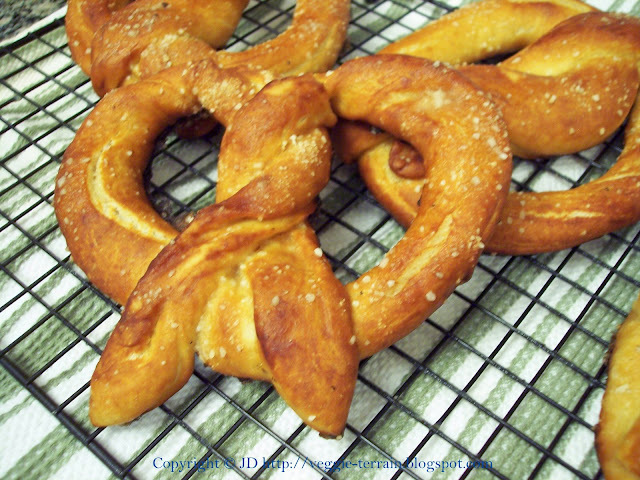 Then, gently dip each pretzel into the solution & arrange on prepared baking sheet. 11.) Melt 6 remaining Tbsp. butter in shallow dish, dip hot pretzels in it, & place them on a wire rack, allowing excess butter to drip off. 12.) Top with seasonings of your choice (ex: garlic/onion powder), & serve with mustard, if desired. *Hint: When measuring the dough (while stretching it), use a 30 in.-long piece of plain dental floss as your guide re: length. OMG!! WHERE HAVE YOU BEEN??? Making pretzels of course...ya go away and lead interesting lives...i geddit...i geddit! O yum, they look so good! Those look great! I love soft pretzels! For some reason when I make them I can never roll it out long enough so I end up with really fat pretzels. wow--these look fantastic! and so easy to make, too! i've got to try these. my mouth is watering already. love that you dipped them in garlic powder and mustard...mmm. love the pictures--the pretzels look like the real deal! WOW! 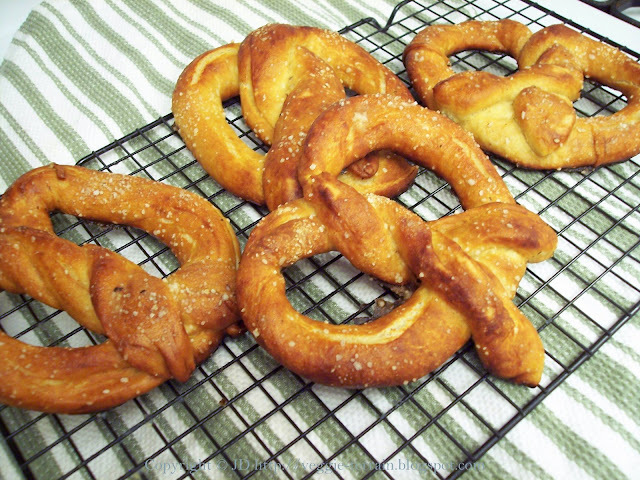 Your pretzels turned out amazing ~ they look like the real deal. However, I bet they tasted better than any pretzel you could buy because it looks like hard work to make them. I might have to try these now too. Thanks for sharing! Mmmm I've never tried big pretzels. Only those dry things that come in packets from the supermarket. These look so wonderfully good though I know I'm going to have to try soon! Pretzels look so goood! Thanks for leaving comment at my blog. I'm still scared to delve into the world of yeast... These pretzels looks so worth it! But that doesn't mean that yeast doesn't still frighten me. Hehe, I think my pretzels would have to be cinnamon sugar ones! ...and the oscar goes to you for making awesome pretzels. garlic pretzels are the best.